Cosy Feet Ladies Daisy-Mae Shoe For Swollen Insteps. A pretty, contemporary style that’s lightweight, roomy and provides a stylish solution for swollen insteps! Thanks to the lower cut of this pretty shoe, it’s ideal if you have lots of swelling across your foot or around your ankle. The discreet, touch-fastening strap can be easily adjusted giving you tailor-made comfort that lasts all day. 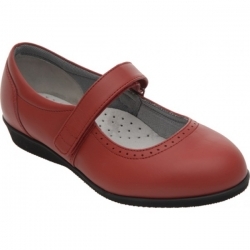 Soft and supportive, it’s as dainty as it looks due to the lightweight but hard-wearing sole. Perfect for parties, evenings out or wearing to the office. Bought these on behalf of my 90 year old mum. Impressed with the initial help given over the phone. Ordering and delivery was very straightforward. She is very pleased with the quality, fit and comfort of the shoes.